LED lighting solutions company Syska LED on Wednesday announced the launch of its latest Wi-Fi enabled smart table lamp compatible with Amazon's Alexa digital assistant. With the help of this integration, voice commands can be used to control this table lamp. It offers three different colour temperatures including Warm White, Day Light, and Cool White, with temperature ranging from 3,000K to 6,000K. 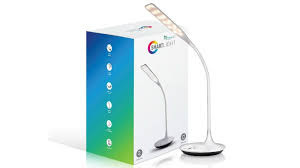 The Syska LED smart table lamp has been priced at Rs. 3,699 and will be available online on Amazon.in and Flipkart. This is the company's second product as part of its Wi-Fi-enabled smart devices catalogue. Syska's new smart table lamp comes with 3 stages of brightness as well, allowing the user to adjust brightness in the room depending on mood. With Amazon's Echo range of devices, including the Echo Dot, Echo, Echo Spot, and Echo Plus, users can get hands-free access to the lamp. There is something called 'feather touch controls' that are present on the base of the smart lamp with controls such as on/ off toggle, colour temperature toggle, and 3-stage dimness. Add to that, the Syska smart table lamp offers a night mode for reading in low light. It is flexible to use, and can be bent to quite an extent. Syska claims that its LED light can last up to 30,000 hours or more than 5 years, and is much more durable when compared with traditional incandescent and CFL lamps. "As an endeavour towards providing the best customer experience through innovative product solutions, we have been introducing Wi-Fi enabled products for our tech savvy consumers," said Gurumukh Uttamchandani, Executive Director, Syska Group. "In today's time, technology is playing a key role in our daily life and introduction of such products will definitely bring more value and comfort to millions of customers across the country."